Our monthly round-up of manufacturing equipment hand-picked by us, the editors of Food Processing. Achieve gentle handling and constant remixing of contents with the company’s flexible screw conveyors. The conveyors are said to provide dust-free, low-energy, low-maintenance and low-cost conveying solutions. A constant tumbling effect provides a homogenous mix of particles in the conveyor when feeding pre-mixed ingredients. The conveyor can also be used as an ingredient mixer by adding a second product inlet. A controlled feed provides proportional ingredients mixture. Spiroflow Systems Inc.; Monroe, N.C. Create consistent looking and cooking patties with the Ultimate Patty Fill System. The system can form patties in portions up to 1-inch thick and 10 oz. in weight. Patties that are formed with the system are assembled in random grinder-sized strands instead of being subjected to the typical excessively high pressures that can result in patty toughness. The interweaving strands allow for excellent transfer of heat through the product, making cooking times faster and patties more uniform. Ultimately, the unit creates a patty with tenderness and consistent shape and weight retention after cooking. NuTEC Manufacturing; New Lenox, Ill. The company’s bulk bag filling process systems include automated pallet introduction, automated metering of material supply, NTEP-certified, precision bag weighing and automated, filled-bag accumulation conveyors. They enable a single operator to process up to 20 4,500 lb.-capacity bulk bags per hour, or 90,000 lbs. of dry bulk material per hour. The system increases efficiency and safety and reduces material loss. Optimization begins during the staging of the first pallet when the hydraulic carriage lifts bag capacities up to 4,500 lbs. The weigh system provides accuracy of +/- .01 percent. Precision weighing improves total process efficiency by eliminating re-working of over- and under-filled bags. A single, menu-driven HMI centralizes system-wide operations, including legacy, upstream material supply equipment. National Bulk Equipment Inc.; Holland, Mich. There are plenty of food & beverage applications for the completely integrated In-Sight 7000 vision system. It features autofocus, fast image capture, integrated lighting and lens with powerful vision tools for inspection, color, OCR applications and more. The integrated, field-replaceable lighting has five color options (red, blue, green, white and infrared). You can also power and control a range of external lighting. It can inspect, gauge/measure, guide/align, read characters and read bar codes — all in a compact, industrial IP67 package. The PSQ 2.5-inch sanitary gauge is now available with a ¾-inch fractional seal and Tri-Clamp connection, bottom or back mount. The dial has an accuracy of +/-1.5 percent and comes standard with a food-grade glycerin fill and an industrial grade polycarbonate lens. Designed for clean-in-place and steam-in-place installations, the gauge complies with the 74-05 standard and is built to withstand all applications where 3A approval is required in sanitary installations. Control the removal of defects and foreign material to produce quality batch-fried and continuous-fried potato chips with the company’s digital sorters. Using camera laser sorters to identify and remove the widest variety of defects, the sorters find green spots, bruises and overcooked black spots. In addition, the lasers detect batch-fried defects such as doubles and clumps of chips stuck together, and oil and blistered chips. Split-sorter configuration is available, enabling simultaneous double product sorting. Key Technology Inc.; Walla Walla, Wash.
HydroWhirl Poseidon nozzles now include lower flow rates from 4.45 gpm to 26.3 gpm. The smaller-sized tank washing nozzles are designed to fit through opening as small as 2 inches, while maintaining a slow and controlled rotation speed. Complete coverage enables increased impact and cleaning efficiency with a slow spinning spray and a longer spray dwell time on the target surface. Fluid-driven and lubricated, the rotating cleaning nozzles are made of corrosion-resistant PTFE and are idea for harsh chemical environments. BETE Fog Nozzle Inc.; Greenfield, Mass. The company’s grain endurance package adds protection for gear drives that serve the grain industry. The package meets a variety of processes and applications from transportation of material to flour and feed mills to crushing and blending facilities. In addition, it includes filter cart quick disconnects, oil sample port, sight glass and keyless shaft connections. According to the company, the drives are built to withstand dust and weather and are designed for the efficient movement of grain. Nord Gear Corp. USA; Waunakee, Wis.
Detect and separate metal while filling bulk bags by weight, dust-free, with the company’s sanitary bulk bag filler with metal detection. Equipped with an integral metal detector/separator that detects metal in the free-fall stream of material entering the filler, the unit ejects metal through a chute that discharges into a removable drum at the back of the unit. The filler also features adjustable head height for popular sizes, an inflatable cuff forming a seal to the bag inlet spout, a blower to remove bag creases prior to filling, load cells for filing by weight and a vent port for dust-free air displacement during filling. The interchangeable packaging capabilities of the high-speed Mondini Trave include: below the flange skin packages; protruding and super-protruding skin packages; stretch seal packages; Darfresh on Tray packages; MAP packages - high and low O2; die cut lid packages; aluminum trays; crimped aluminum pans; double decker packages; and rigid/rigid packages. The company’s filling and depositing technology is said to be ideal for dry, free-flowing products, including sugar, sprinkles, chocolate chips, oat flakes, sliced nuts, dry low-fat streusel and flour. The depositor can be mounted on existing equipment of new conveyors and are available with portable cantilevered frames. An operator interface stores multiple recipes for easy operator set-up. The depositor is made of stainless steel with variable speeds and a targeted deposit. Quick change tooling is available to change the deposit centerline. S-10FA is a filming amine formula for corrosion control in boiler condensate systems. The molecules of S-10FA anchor their hydrophilic heads to wetted metal surfaces while their hydrophobic tails will shield metal surfaces from contact with acidic corrosive condensates and prevent corrosion products, dirt and other impurities in condensate return system from attachment to the metal. A thin protective field is formed on the metal when S-10FA is volatilized in the steam stream. S10-FA is thermo-stable and compatible with a majority of boiler treatment chemicals. Cortec Laboratories Inc.; St. Paul, Minn. The YieldScan Rapid Yield Analyzer, developed in conjunction with Georgia Tech Research Institute, gives poultry cone line operations accuracy and productivity in real-time yield detection management. It employs vision-based detection technology to enable many more bird frames to be evaluated. Its evaluation speed – less than two seconds per frame – represents an improvement over traditional methods of evaluation, the vendor says. It provides: constant data available in real time, solving the problem of “stale” information; more flexibility in managing production line personnel and pinpointing performance problems for immediate intervention and attention; an environment of improved worker industriousness and conscientiousness; and the ability to structure incentive pay programs for operating personnel, based on objective data rather than subjective factors. Water Circulating Temperature Control Units (TCU) are engineered for accuracy and will perform to spec in numerous industrial processes with temperatures up to 300°F (149°C). Each unit is equipped with microprocessor based PID temperature controls that deliver accurate, reliable and cost effective process temperature accuracy. Stainless steel is used for key components to insure long and maintenance free performance and to reduce total cost of ownership. Pumps are available from ¾ to 7.5 HP with a delivery capacity of 25 to 100 GPM to provide a broad range of heat transfer capability and temperature control in a compact footprint. Delta T Systems; Richfield, Wis. The SmartBob AO level sensor with integrated 4-20 mA analog output received hazardous location certification. It is listed for Class II, Groups E, F and G, and enclosure types NEMA 4X, 5 and 12, ensuring the sensor is safe to use in locations where combustible dust may be present. This continuous level sensor works like an automated tape measure, but eliminates the needs to climb bins for manual measurements to reduce risk in the workplace. The SmartBob AO features two relays that are configurable by the user. The user simply selects any two of four different relay options in any combination including measurement status (measurement in process), high level alarm, low level alarm or error alarm (sensor did not take a measurement). A monthly round-up of manufacturing equipment hand-picked by editors of Food Processing. 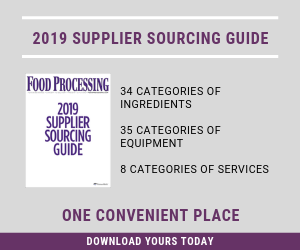 Food and beverage equipment hand-picked by the editors of Food Processing. A reader would like to know how to justify expensive parts as critical spares.